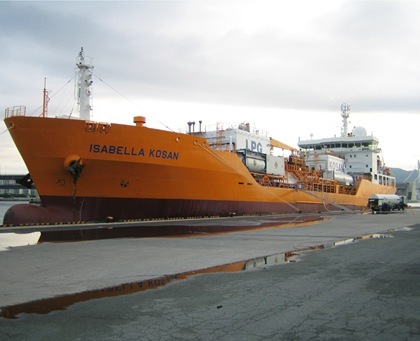 Refrigerated Gas Carrier ‘Isabella Kosan’ has been judged as ‘Ship of the Year’ at the Lloyd’s List London Awards 2008. The award was given by considering parameters like innovation, safety, environmental protection and operating efficiency. The most important innovation used in ‘Isabella Kosan’ is the provision to use the evaporated gas from the cargo, as fuel in one of her generators to produce electricity. One of the MAN Diesel 7L16/24 engine of the generator has been specially adapted by MAN B&W Diesel’s GenSet division in Holeby to run on dual fuel. Approximately 20 percent of the normal liquid fuel is substituted by cargo residue. This innovation helps to avoid release of evaporated/surplus gas to atmosphere or burning off without any use. the 8,000 cbm LPG/ Ethylene-Carrier, built at Sekwang Heavy Industries in Ulsan, Korea. belongs to Danish Shipowner Lauritzen-Kosan. separate compressor shelter for each cargo tank. and supervision of the construction, pre-commissioning, commissioning and performance tests. TGE Marine Engineering has carried out the basic ship design documents up to the classification level, which includes also ship line development, model testing and hydrostatic calculations. innovative Cargo Container Monitoring solution provided by API Marine using unique non-contact measuring acoustic principle. For more information on dual fuel generators read MAN Diesel Facts here and here.